DIE Jovis, 4 die Octobris. Hastings committed to The Tower. Bp. Chester, Thanks for his Sermon. Epus. Sarum. Ds. Cancellarius Angl. Hodie 3a vice lecta est Billa, "An Act for the naturalizing of Isabella of Nassau, Wife of the Right Honourable the Lord Arlington, One of His Majesty's Principal Secretaries of State." To deliver to them the Bill for naturalizing of Isabella of Nassau, and desire their Concurrence thereunto. Next, the Roll of the Standing Orders of this House was read. This Day Beaumont Hastings was brought to this Bar, as a Delinquent. 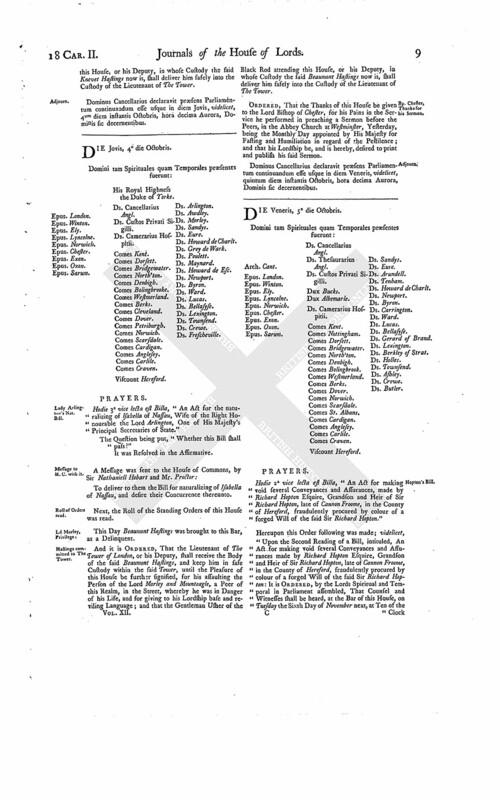 And it is ORDERED, That the Lieutenaut of The Tower of London, or his Deputy, shall receive the Body of the said Beaumont Hastings, and keep him in safe Custody within the said Tower, until the Pleasure of this House be further signified, for his assaulting the Person of the Lord Morley and Mounteagle, a Peer of this Realm, in the Street, whereby he was in Danger of his Life, and for giving to his Lordship base and reviling Language; and that the Gentleman Usher of the Black Rod attending this House, or his Deputy, in whose Custody the said Beaumont Hastings now is, shall deliver him safely into the Custody of the Lieutenant of The Tower. ORDERED, That the Thanks of this House be given to the Lord Bishop of Chester, for his Pains in the Service he performed in preaching a Sermon before the Peers, in the Abbey Church at Westminster, Yesterday, being the Monthly Day appointed by His Majesty for Fasting and Humiliation in regard of the Pestilence; and that his Lordship be, and is hereby, desired to print and publish his said Sermon. Dominus Cancellarius declaravit præsens Parliamentum continuandum esse usque in diem Veneris, videlicet, quintum diem instantis Octobris, hora decima Aurora, Dominis sic decernentibus.